After a good night’s sleep and leisurely start, our pilgrims loaded the bus and headed for Mt. Tabor, the sight where Jesus was transfigured before Peter, James and John. Mt. Tabor is just a few miles west of the Sea of Galilee and not far from Nazareth. One would think that Jesus could have easily come here on numerous occasions prior to his public ministry. 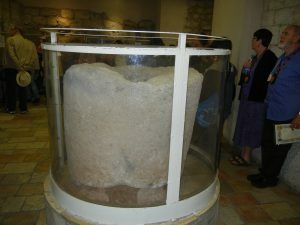 Could this have been a special place for him, and this the reason for selecting it as the site to reveal his glory to his apostles prior to his passion and death? The walk to the top of Mt. Tabor could not have been an easy hike. But then again, for Jesus and the Apostles who walked much, perhaps it was no big deal. We arrived on the mount well in advance of our time for Mass. I had the opportunity to offer the sacrament of reconciliation to out group, and most of them took prayerful advantage of the opportunity. 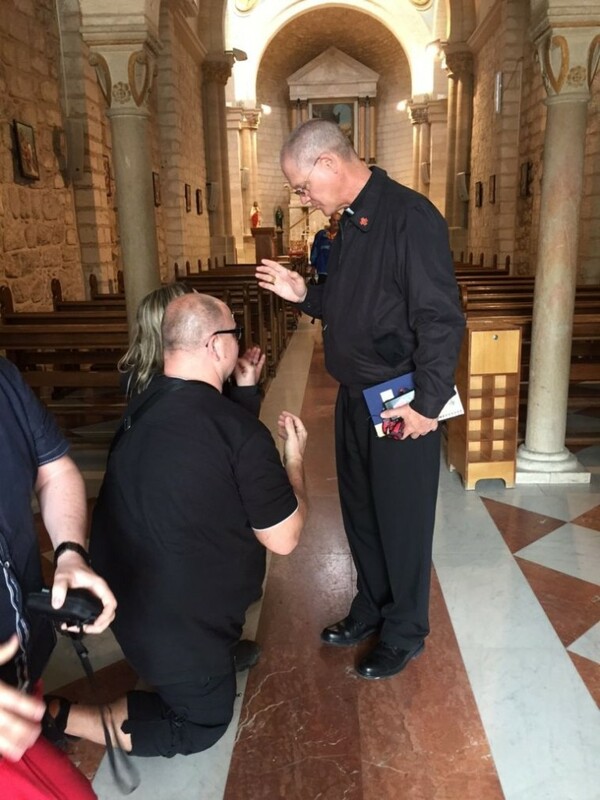 What a marvelous way to prepare to celebrate Mass on this holy site. Matthew 17:1-9 recalls this moment in the Gospels. Jesus took Peter, James and John and led them up on the mountain. He was transfigured before their eyes. This is an important point for all of us. Jesus calls each of us. Jesus leads each of us, in order to reveal himself to us. We are simply called to accept his invitation. Today, our group renewed our commitment to follow Jesus. Then, the Father speaks to the apostles and proclaims Jesus as his Son and tells them to listen to him. This is the second invitation to all of us. We are called to listen to Jesus. Finally, after this significant event, on the way down the mountain, Jesus tells his apostles not to tell anyone about this until after the resurrection. Well, here we are in the Easter octave! It is after the resurrection. Now, we must be witnesses for Jesus. Now, we must tell others about him. This is our calling: Follow Jesus. Listen to Jesus. Be an evangelist by sharing our story of faith with others. After descending Mt. 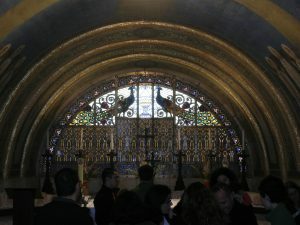 Tabor, and a lunch break, we went to Cana, the site of Jesus’ first miracle where he changed water into wine at a wedding feast. The church built over the location where it is believed Jesus worked the miracle of changing water in to wine is an active parish today. There is a lovely painting of the miracle which hangs in the center of the sanctuary. 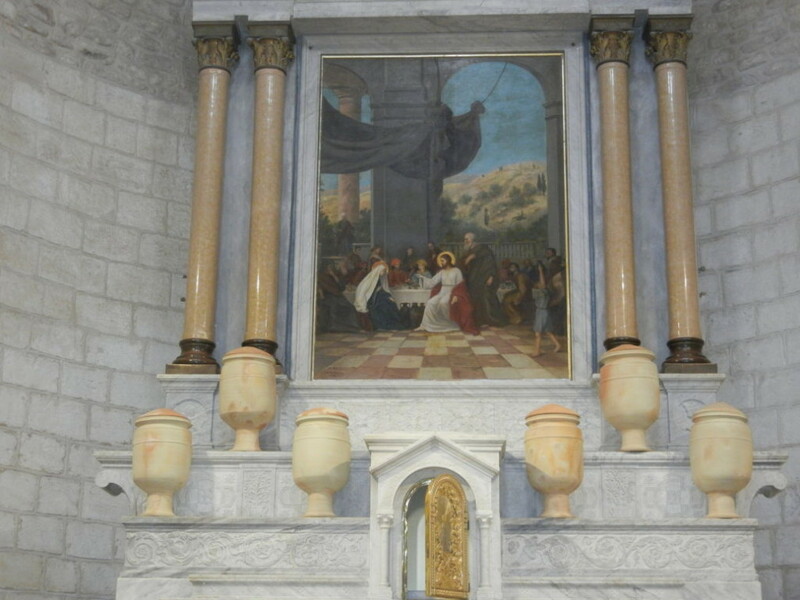 Also, you will notice in the picture the stone water jars that adorn the altar above the tabernacle…quite a nice touch! You will notice in the picture that the tabernacle door is open. 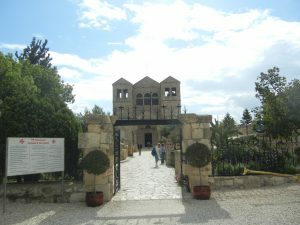 That is because, here in Cana, today is Good Friday. 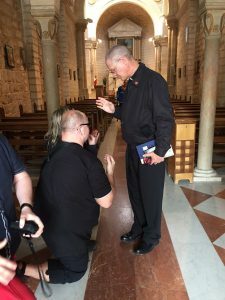 This was my first visit to this holy land site, and it was very powerful to invite the married couples of our group into the sanctuary to renew their wedding vows. After this brief ceremony, they all wanted their picture taken with the bishop. As the couples were taking turns coming into the sanctuary for their picture, I noticed two polish couples in the front pew trying to take pictures of the church. Finally, one of them came up to me and wanted their picture taken with me. He told me that he and his wife were celebrating their 25th wedding anniversary, and wanted their picture as well, which I gladly accommodated! Once our group left the church, I remained behind to pray for my own parents, my brother and his wife, my many married friends, and all married couples in the diocese of Cheyenne. As I was leaving, this same Polish couple approached and asked for my blessing, which I gladly granted. It was very humbling to be a part of the anniversary of these total strangers who recognized the beauty of the sacrament they shared, and made pilgrimage to this site to celebrate their milestone anniversary. That is church! The Cana miracle is a great instruction for married couples. (John 2:1-11) First of all, at this time, the wedding celebration went on for a week! There was much to celebrate. This is the kind of reverence and respect for the sacrament we need to rediscover today. Once the couple ran out of wine for their guests, Mary went to her Son, Jesus, and told him: “They have no wine.” It is significant that Jesus performs his first miracle within the context of a wedding. That, too, tells us how important marriage is in the plan of God. It is as if Mary is asking Jesus to reveal his true self to this couple. Indeed, the miracle of Jesus changing water into wine does just that. This is a miracle of joy for this couple; for all of God’s people. Then, Mary turns to the servers and tells them: “Do whatever he tells you.” Here is another marvelous instruction for all of us about obedience to Jesus, both within marriage, and for all of God’s people. The fruit of obedience to Christ is nothing short of miraculous procurement of all our true needs. 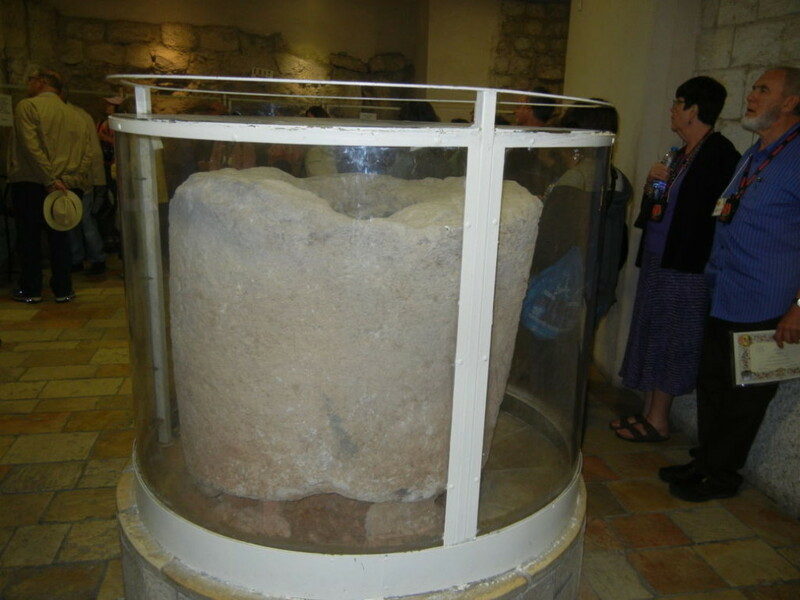 John’s Gospel which recalls this miracle tells us that present in this home were six stone water jars, each holding 20 – 30 gallons. (see picture!) This jar is about 4 feet tall. How would you like six of these filled with the choicest wine?! Obviously, you do not pour from these containers. One had to dip the contents out of the container. This was a real eye-opener for me today. Our last stop of the day was at a very new church built on the shore of the Sea of Galilee in the ancient city of Magdala. This property is now owned by the Legionaires of Christ. When they began building a hotel on the site, they discovered the ancient ruins of a fish market and synagogue. They also built a beautiful church in the honor of Mary Madalene. In her honor, the church is also a largely built to honor the dignity of all women. The name of the Church is Duc In Altem; Put out into the deep. 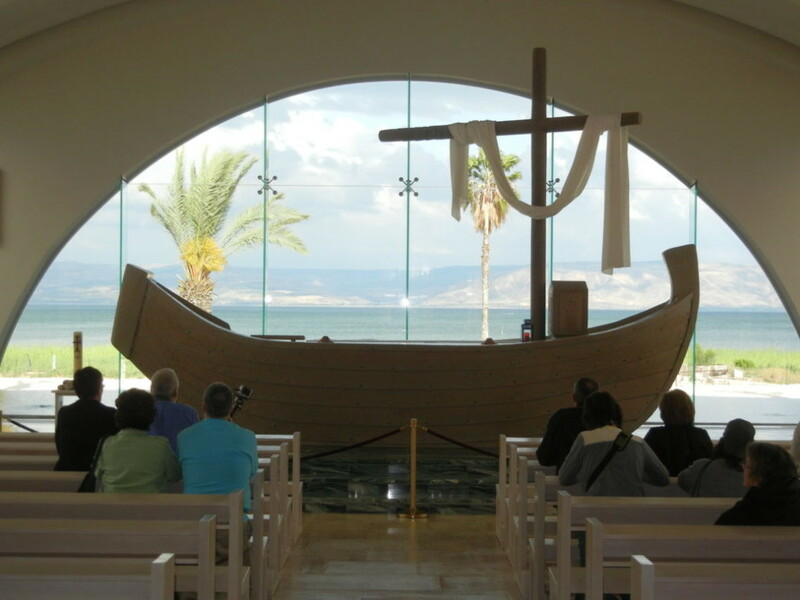 The altar is built in the shape of an ancient fishing boat. You may recall reading in 1986 about the discovery of an ancient fishing boat in the exposed lake bed of the Sea of Galilee. The boat was in amazingly good condition and dated back to the time of Christ. It was quite the archeological find. It was discovered in this vicinity, and probably inspired the design of this altar. Here, our group took some time to pray and reflect before returning home. It was quite inspiring to see a church dedicated to the honor of women. It has been another great day in Galilee. In the morning, we will have an early Mass in the church on the Mt. of Beatitudes before making our way to the River Jordan, Dead Sea, Jericho and Bethlehem. Please know of our continued prayers for all of you, and please continue to keep us in your prayers! The grace for me today was to discover the person of Jesus and the Kingdom of God, not just in these holy sites, but in God’s holy people.